SMI will be presenting the new ECOBLOC® PLUS system. A compact, cost-saving and eco-friendly integrated solution! SMI laboratories' relentless engagement in Research and Innovation projects has led to the launch of Smiform's ECOBLOC® PLUS series, featuring integrated systems of stretch-blowing, filling/capping and labelling of PET containers with capacity from 0.2 to 3 L, running up to 36,000 bottles/hour (depending on the machine model and product features). - considerably lower energy consumption. 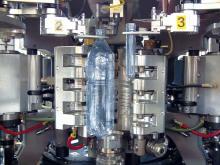 The ECOBLOC® PLUS system displayed at Interpack 2011 features a 8-cavity stretch-blowmoulder for the production of 0.5 L PET bottles from 11 g preforms; the bottles are filled and capped by a 42 valves electronic filler using the "baseless" technology and then labelled with the application of adhesive sleeves. The integrated labelling unit employes the "Adhesleeve" technology by P.E. Labellers, using adhesive sleeves with no need of hot glue application. The whole system ensures high level of hygiene and cleanliness, as well as making cleaning and maintenance operations easier and driving down the risk of product contamination. Why choosing Smiform ECOBLOC® PLUS! Smiform integrated systems of stretch-blowing, filling/capping and labelling can boast several benefits in terms of cutbacks on costs, efficient use of space and reduced maintenance requirements. 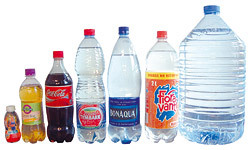 The bottle transfer by direct "starwheel-to-starwheel" handover reduces the number of machines installed, with no need for conveyors between the blower, the filler/capper and the labeller. The cam-controlled technology featured by the stretch-blowing module vouches for high precision and reliability. All ECOBLOC® PLUS models are equipped with an air recovery system, an eco-friendly technology which allows huge cutbacks on energy costs and provides up to 40% saving on high-pressure air consumption. 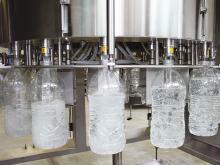 The compact and ergonomic design of the ECOBLOC® PLUS integrated system are the result of hi-tech engineering solutions; likewise the "baseless" manufacturing technology applied on the filling and capping module leaves the area underneath the bottles completely clear, so as to ease the operator's access to the machine for maintenance and cleaning operations. The electronic filling process employed on ECOBLOC® PLUS prevents any contact between the bottle and the filling valve, thus reducing the moving mechanical parts and preserving the integrity and quality of the product. Smiflexi end-of-line solution for top-level reliability and efficiency. 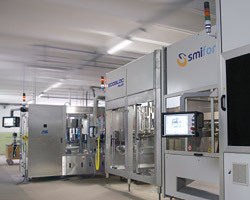 On the occasion of Interpack 2011, SMI will also be exhibiting a Smiflexi's shrinkwrapper, model SK 350 F (running up to 35 packs/minute), combined with a Smipack's HA40 handle applicator. SK shrinkwrappers can run up to 450 packs/minute (depending on the machine model and product features) and pack a wide range of containers in a variety of packages, so as to answer efficiently and effectively to current and future market trends. 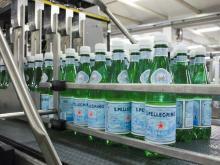 Smiflexi packers are automated and controlled by Smitec division's MotorNet System®, based on a Sercos fieldbus. Such system enables the operator to monitor the whole machine operation step by step and to switch product size and format straightaway. Don't miss the opportunity to discover Smigroup's latest solutions! We look forward to meeting you at our STAND 14D06/D12 - HALL 14 and are at your full disposal for any futher info you might need.